Glad that he found a fix and I don’t mean to be rude, but it sounds like he has no idea what he did. I think it would be better to write up a batch script to automate steps 1-8 (twice) then have the user plug in and update. A script could easily be typed out by the user and run. What do you guys think of Acer? Are they generally reputable? I have an AR1600, for which there is almost no documentation, and absolutely no reference to it is made on Acer’s websites. And this… This is quite the fuckup. It’s like someone made a change and pushed it to the update server without ever testing it, instantly screwing over everyone unfortunate enough to run updates in that period. Indeed you are correct – I had no idea what i did, and I have very little knowledge of Linux commands(although I now know a little bit more!). Basically I tried a few commands suggested on the internet as a fix, none of which fully did the job. Eventually i stumbled across a combination which worked, and was repeatable – i restored the faulty partition from a backup repeatedly until I found the exact sequence of commands that did the job. As for writing a script – yes it would be a more elegant solution – but for the amount of typing required by the user I think it would be slight overkill. Many thanks for your constructive criticism. I thought Acer had canned its linux using netbooks. I’m sure they probably have. Despite that, it would appear that there are still some out there in 2011 which are feeling a bit sick. In case there are any more I thought this info would be of some use to someone. It’s nice to see a fix for this at last. I got so annoyed with this that I just installed Ubuntu on my AAO instead. Which is no bad thing because Ubuntu is infinitely better than that poxy “Linpus” distro it coms preinstalled with. Amusingly enough, installing Ubuntu would actually be a faster fix than following the steps outlined in this tutorial, but nevermind. Yes you’re probably correct – and if it was my machine that’s exactly what i would have done. This was a repair for someone elses machine so I wanted to retain the OS and files as much as possible. As for the “-f” switch for the rm command – many thanks for that – it would have made things easier, but as I no longer have the AAO I will leave the info on the web site as is. Odd, I have the opposite problem. I can’t find a netbook without the useless Windows 7 starter installed. Go on new- egg and youll read lots of complaints from people who will not get a refund for windows even when they refuse the EULA and install something else. The problem is that ACER and other netbook makers didn’t put any effort into properly configuring their OS. I regularly set up netbooks for my students. A USB stick set to boot and an internet connection are all that’s necessary. Several distributions of linux are specially configured for Netbooks, such as Mint, Puppy linux and even a version of Ubuntu for netbooks. 3 min on google should be all you need to find a link to the USB boot loader for these. 1) set your BIOS to boot from USB. 4) enjoy a much faster more capable Netbook without the brain damaged windows 7 Mobile. ACER is a good company I have purchased hundreds of thousands of dollars worth of their equipment over the years. The netbook itself is great, I just wish they would have taken a few min to put a decent distribution of Linux on their netbooks. The Aspire one is a great little machine but the linux ‘linpus’ build it ships with is awful. If you have one do yourself a favour and install ubuntu netbook remix instead. If you need a “decent” laptop, Walmart sells a compaq full sized laptop for 350$ that does most of what my clients need these days. Yes, it defaults to a Windows 7 install, but Ubuntu is tremendously friendly to all the hardware on it. It works better than the preinstalled Win7. Of course, it doesnt have things like a SD card reader, or webcam built in. It’s a wee skimpy on RAM and only 250GB hd. 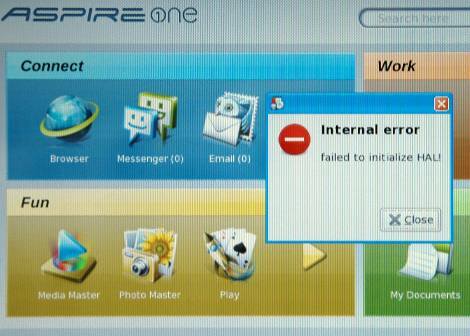 You know, if you’re using the Aspire One Linpus distro that came with the unit, you have bigger issues than the HAL error that might pop up… considering it’s Fedora Core 8 based and has been unsupported for about 2 years now. I know some people want to stick with what works…but at that point, UPGRADE ALREADY! Acer Linpus is a very bad O.S. Seems Acer haven’t idea about Linux and about SSD too. They makes a swap partition on Linpus! In my opinion they install bad versions of Linux to promote Microsoft O.S. Best thing to do is to fdisk again SSD and install Slackware Linux 12.2! I installed ubuntu on mine. oh, and is it really a BIOS bug that causes SD cards to not be recognised by ubuntu unless inserted at boot? Install fedora 13 or 14 its wayyyyy better than linpus. Yeah, actually that’s what I did in the first instance, however I found the performance was pretty dreadful, and it would take over a minute to get a wifi connection from a cold start. So I decided to install the “Normal” ubuntu Desktop (which is also available as a USB stick installer – very handy). I would recommend that course of action if you have enough internal disk space (I’ve got the 120gb spinny disk version). Runs like a dream on my AAO – very responsive and great hardware support. But all that said, I do appreciate the effort that was put into fixing this very agravating problem – perhaps people who buy AAO’s second hand will get the most benefit from it. I’m on my second Aspire one (10.1″) and these things are solid. My first one went down the stairs, was sat on, got hacked to hell and back and the only reason I got a new one was because the 521s have the new AMD / ATI chipset and DDR3 ram – it’s faster than balls. It’s actually sitting underneath my car seat and I use it occasionally in a pinch – everything still works solid (even though the plastic is starting to crack and I don’t have a wifi cover anymore), and I’m even running windows 7 ultimate with Aero. If you want an amazing netbook, grab an aspire one that suits your flavor, get 2gb of ram and an extended battery and be happy forever. I also replaced Linpus with Ubuntu Netbook Remix, and even my wife loves it, to the point she no longer uses her crappy XP laptop anymore. Those Aspire One machines are wonderful for couch-computing. I have a ZG5 and removing the mta* files from directory /etc worked out also for me (just removing files and restart). Actually two of those mta??? files I could not remove due to some I/O error.